FORT WORTH, Texas – Extended into Monday because of inclement weather, NASCAR’s spring weekend at Texas Motor Speedway began on a similarly rainy Thursday evening with the annual Texas Motorsports Hall of Fame Gala awards ceremony and charity fundraiser. Sunday’s day-long rain and cold conditions forced NASCAR to postpone the originally scheduled 18th annual Duck Commander 500 Sprint Cup Series race until today at 11 a.m. (CDT). The 334-lap/501-mile event will be televised by FOX at 11 a.m. and broadcast on PRN radio. Team-owner Roger Penske was the headliner as the lone, and 16th, inductee into the TMHOF. But the festivities morphed into racing’s version of “A Night at the Improv,” courtesy of long-time Cup Series sponsor Norm Miller, chairman of Interstate Batteries, and driver Kyle Busch of Joe Gibbs Racing. Busch was honored as Texas Motor Speedway Racer of the Year. Busch became the first driver to sweep the NASCAR Sprint Cup and Nationwide Series races in the same weekend last spring via victories in the NRA 500 and O’Reilly Auto Parts 300, respectively. 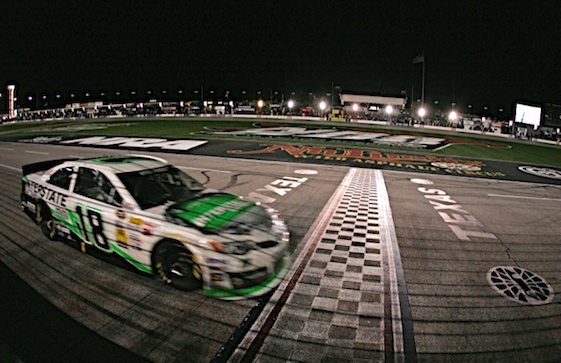 Busch’s victory in the O’Reilly Auto Parts 300 was the sixth Nationwide Series win of his career at TMS, moving him past Kevin Harvick for most in that series at “The Great American Speedway!” Busch’s weekend included a Sprint Cup qualifying track record speed of 196.299 mph. Miller noted that Busch has led 9,960 laps in NASCAR, leaving him 40 short of 10,000, a total that would place him 15th in the history of the sanctioning body. Miller added that Busch has won one out of every 12 starts. “Five or six years ago, when Kyle said his goal was to win 200 races in NASCAR, I had to say I thought, ‘Well, that’s kind of arrogant – 200 races in NASCAR,’ ” Miller said. “Well, here we are now and he’s at 130. I did the math and if he makes it 12 more years, he’s pushing 250. So that would be interesting to see how that works out. “But for us, the biggest thing about Kyle Busch as far as I’m concerned is that…can anybody here name the (sponsor’s) name of the first race at Texas Motor Speedway?” Miller’s Irving-based company sponsored the Interstate Batteries 500 on April 6, 1997. “And who won it?” Miller asked. Jeff Burton posted his first Cup victory in the crash-marred event while driving the No. 99 Ford fielded by Roush Fenway Racing and sponsored by Exide Batteries. Meanwhile, Dale Earnhardt Jr.’s continued support for Speedway Children’s Charities-Texas Chapter in North Texas earned him the Maj. General Thomas Sadler Award. With Junior’s assistance, Speedway Children’s Charities-Texas Chapter delivered its most successful event of 2013 during the “BBQ Pit Stop with Dale Jr.” last fall. The event allowed members of “Junior Nation” to enjoy an evening with the Hendrick Motorsports superstar at Hard Eight BBQ in Roanoke while raising more than $38,000 for SCC-Texas Chapter. “I can just imagine there’s countless people that deserve this recognition besides myself,” said Junior, NASCAR’s perennial Most Popular Driver and winner of the 2014 Daytona 500. “Speedway Children’s Charities has been around for so long and it’s something we’ve always been involved in, something I enjoy doing. I want to thank the staff at Speedway Children’s Charities for what they do, all the fans that participate and support the charity, all the drivers – we all pitch-in one way or another. Earlier, native Texan and Nationwide Series driver James Buescher of RAB Racing accepted the Texas Motor Speedway Sportsmanship Award. Buescher’s efforts to help during the cleanup process following the tornadoes that devastated Moore, Okla., last spring epitomized the ideals of sportsmanship. Taking full advantage of his off-week, Buescher and wife, Kris, helped move mountains of debris from devastated neighborhoods. The destruction hit close to home for Buescher, whose brother lives in Oklahoma City. Penske is the only car-owner to score victories on TMS’ 1.5-mile quadoval in NASCAR and INDYCAR-sanctioned events. Penske’s drivers have won 12 combined races at TMS, including a record seven in the Verizon IndyCar Series after Helio Castroneves’ victory last June. Penske’s success at TMS is the latest chapter of an organization that has produced 23 motorsports national championships in 48 years. Team Penske is the most successful Indy-car organization in history with 169 wins and 12 national titles. Penske joined a list of accomplished drivers from various series and innovative motorsports leaders inducted into the Texas Motorsports Hall of Fame since its inception in 2003. Previous inductees: A.J. Foyt Jr. (2003), Johnny Rutherford (’03), Terry Labonte (’04), Lee Shepherd (’04), Kenny Bernstein (’05), Jim Hall (’05), Eddie Hill (’06), Mark Martin (’07), Jim McElreath (’07), Bobby Labonte (’08), Bruton Smith (’08), Joe Gibbs (’09), John Force (’10), Lanny Edwards (’11) and Jack Roush (’12). Penske, on business in Europe, was represented by longtime business partner Walt Czarnecki, executive vice president of Penske Corporation, who noted the company founded and overseen by “The Captain” remains committed to the sport. In addition, four-time IndyCar Series champion Dario Franchitti, who retired from open-wheel racing in November due to injury after a stellar 16-year career, received the Bruton Smith Legend Award. A three-time Indy 500 champion, Franchitti scored 31 victories during a career featuring IndyCar Series championships with Andretti Green Racing in 2007 and Target Chip Ganassi Racing from 2009-11. Franchitti won Indy 500s with Andretti Green in 2007 and with Ganassi’s organization in 2010 and 2012. With that third victory at Indianapolis Motor Speedway, the native of Scotland became just the 10th driver to score three or more wins in open-wheel racing’s premier event. Franchitti addressed the attendees via video recorded during a preseason Open Test at Barber Motorsports Park in his new role as advisor to team-owner Chip Ganassi. Located in the outdoor atrium adjacent to The Speedway Club, the Texas Motorsports Hall of Fame is open free to the public year-round. The Hall of Fame atrium features pedestals of the inductees with a portrait painting and career highlights. The Texas Motorsports Hall of Fame Gala is one of many fundraisers conducted by Speedway Children’s Charities-Texas Chapter throughout the year. Its mission is to care for children in educational, financial, social and medical need and help them lead productive lives. SCC-Texas Chapter has awarded more than $9.4-million in grants and touched the lives of more than three million children since 1997.